Download "Accounts Payable Transformation. 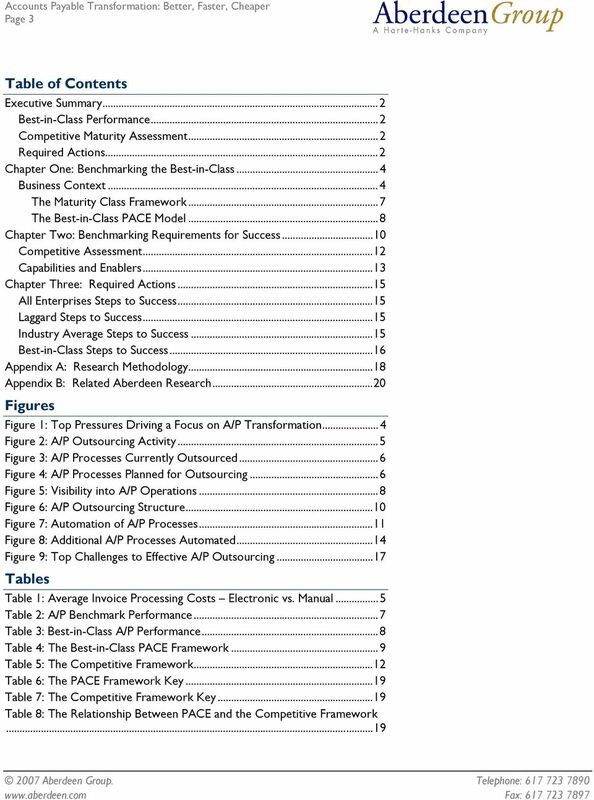 Better, Faster, Cheaper"
7 Page 7 to be driven down and organizations are able to more completely streamline and transform their A/P operations. The Maturity Class Framework Top-performing enterprises effectively leverage an outsourcing strategy, which facilitates transformation through automation and process improvement for accounts payable activities, driving performance improvement. 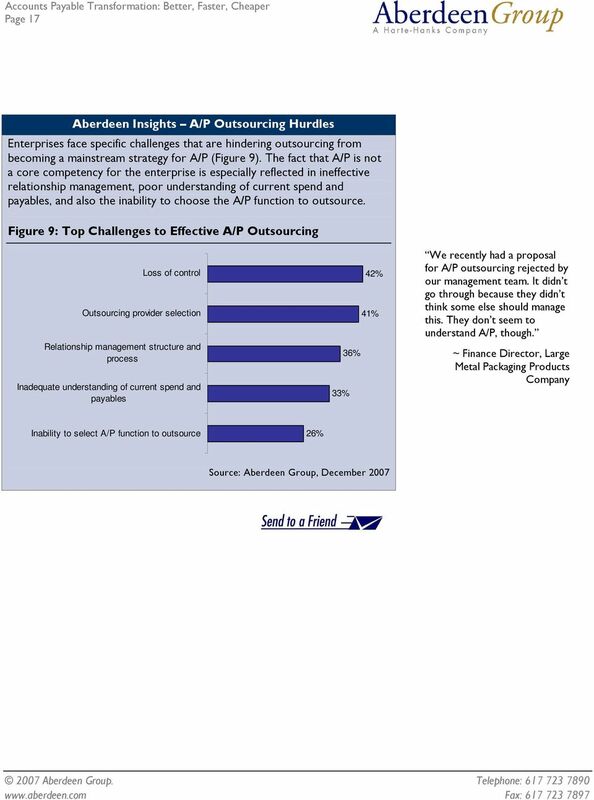 Aberdeen used two key performance criteria to distinguish the Best-in-Class from Industry Average and Laggard organizations: cost and time to process a single invoice. 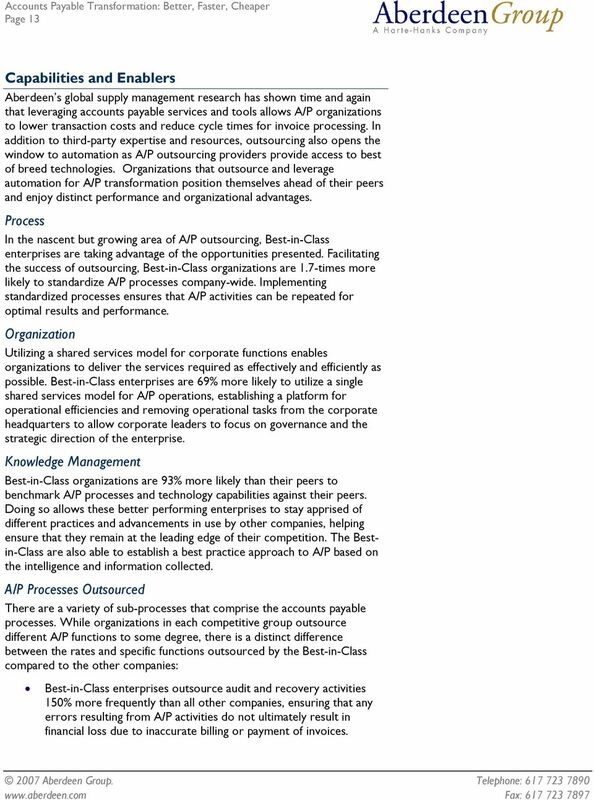 Table 2 summarizes the average performance of enterprises within the different maturity classes for this study. 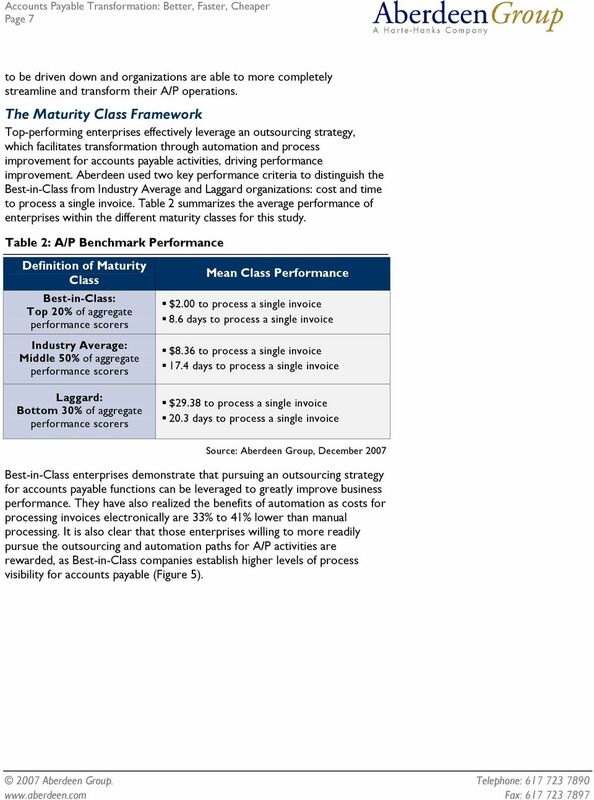 Table 2: A/P Benchmark Performance Definition of Maturity Class Best-in-Class: Top 20% of aggregate performance scorers Industry Average: Middle 50% of aggregate performance scorers Laggard: Bottom 30% of aggregate performance scorers Mean Class Performance $2.00 to process a single invoice 8.6 days to process a single invoice $8.36 to process a single invoice 17.4 days to process a single invoice $29.38 to process a single invoice 20.3 days to process a single invoice Best-in-Class enterprises demonstrate that pursuing an outsourcing strategy for accounts payable functions can be leveraged to greatly improve business performance. They have also realized the benefits of automation as costs for processing invoices electronically are 33% to 41% lower than manual processing. 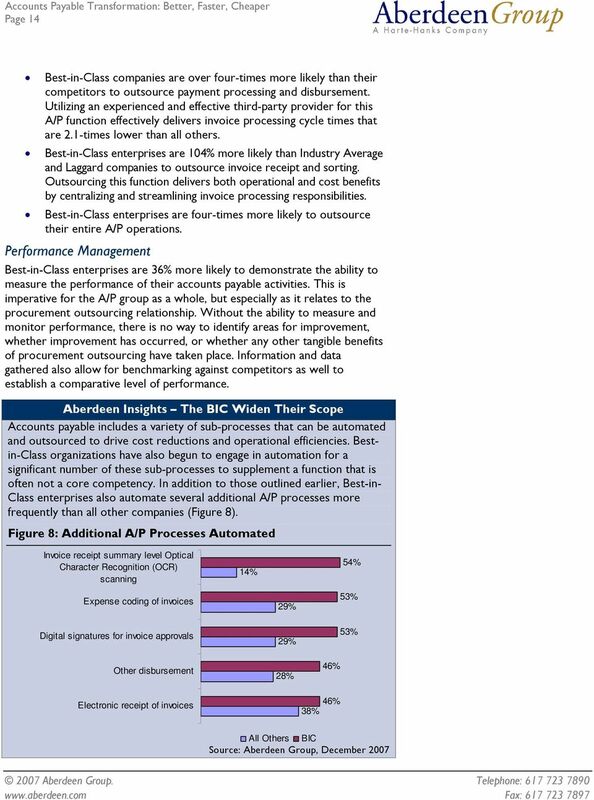 It is also clear that those enterprises willing to more readily pursue the outsourcing and automation paths for A/P activities are rewarded, as Best-in-Class companies establish higher levels of process visibility for accounts payable (Figure 5). 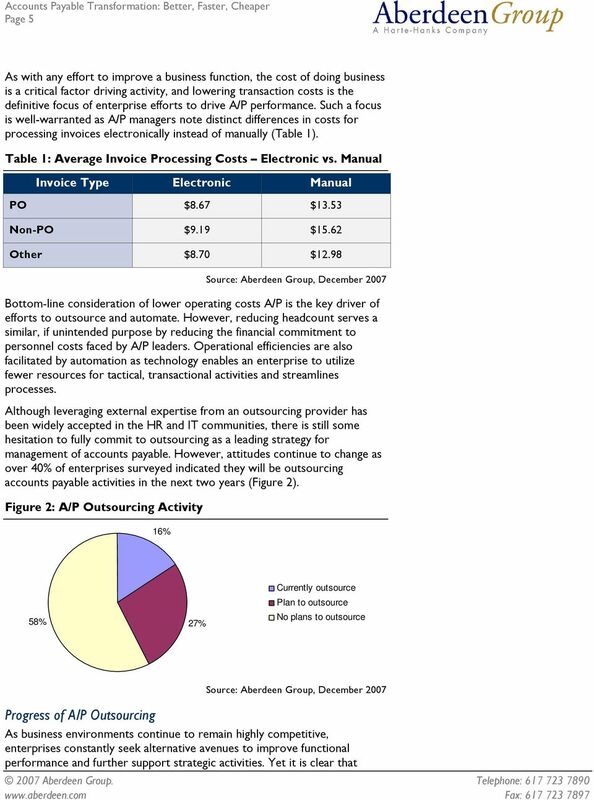 8 Page 8 Figure 5: Visibility into A/P Operations BIC Average 31% 62% 40% 31% 29% 8% Cost reduction was definitely a focus, but we were also hoping to increase A/P visibility across the company. So far, it s been tremendously helpful and has met our expectations on each front. 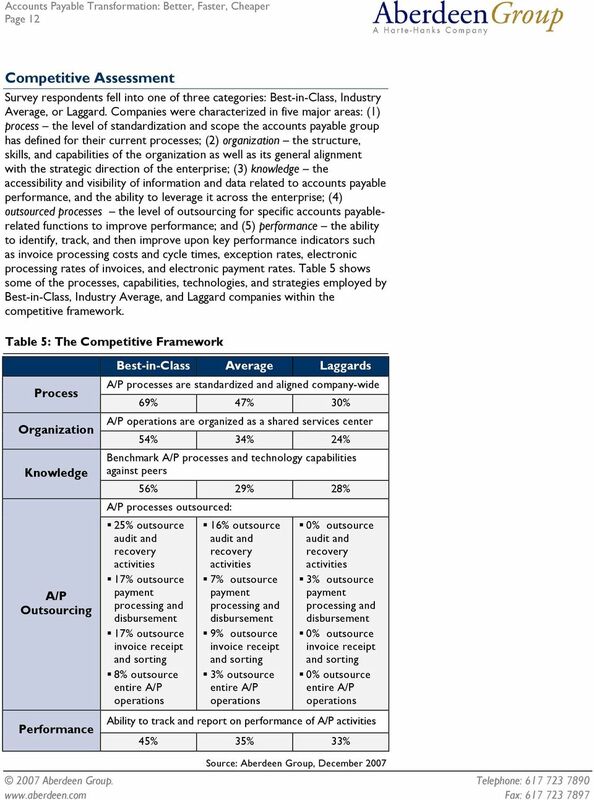 Laggard 25% 40% 35% ~ Large, North American Manufacturing enterprise High Moderate Low/No Along with a decided advantage in visibility into their A/P operations, Bestin-Class enterprises significantly outpace competitors across several key performance metrics (Table 3). 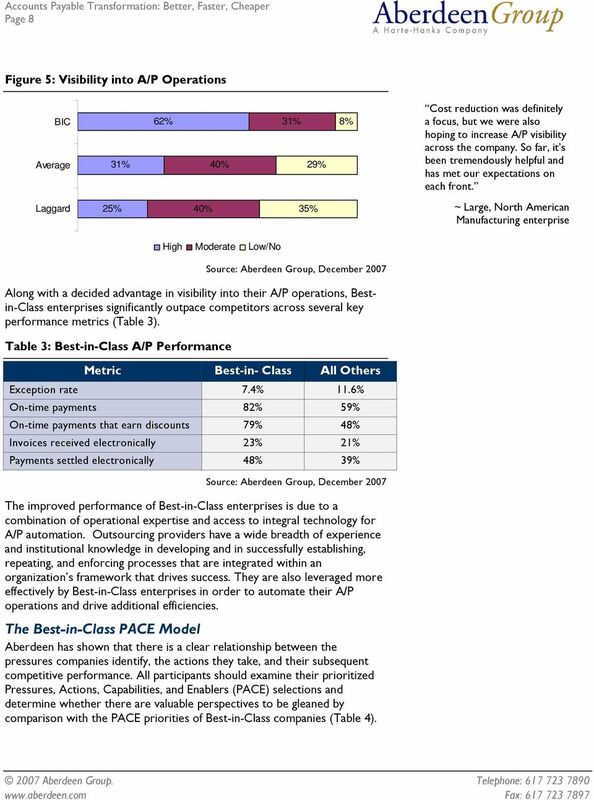 Table 3: Best-in-Class A/P Performance Metric Best-in- Class All Others Exception rate 7.4% 11.6% On-time payments 82% 59% On-time payments that earn discounts 79% 48% Invoices received electronically 23% 21% Payments settled electronically 48% 39% The improved performance of Best-in-Class enterprises is due to a combination of operational expertise and access to integral technology for A/P automation. Outsourcing providers have a wide breadth of experience and institutional knowledge in developing and in successfully establishing, repeating, and enforcing processes that are integrated within an organization s framework that drives success. They are also leveraged more effectively by Best-in-Class enterprises in order to automate their A/P operations and drive additional efficiencies. The Best-in-Class PACE Model Aberdeen has shown that there is a clear relationship between the pressures companies identify, the actions they take, and their subsequent competitive performance. All participants should examine their prioritized Pressures, Actions, Capabilities, and Enablers (PACE) selections and determine whether there are valuable perspectives to be gleaned by comparison with the PACE priorities of Best-in-Class companies (Table 4). 10 Page 10 Chapter Two: Benchmarking Requirements for Success The difficulties faced by an organization s accounts payable group in reducing the cost of transactions and concurrently delivering operational efficiencies are alleviated by looking to a third-party for assistance. Underlying this need is the fact that A/P is not considered a core competency by 35% of respondents to this research effort, highlighting the need for an external expert. 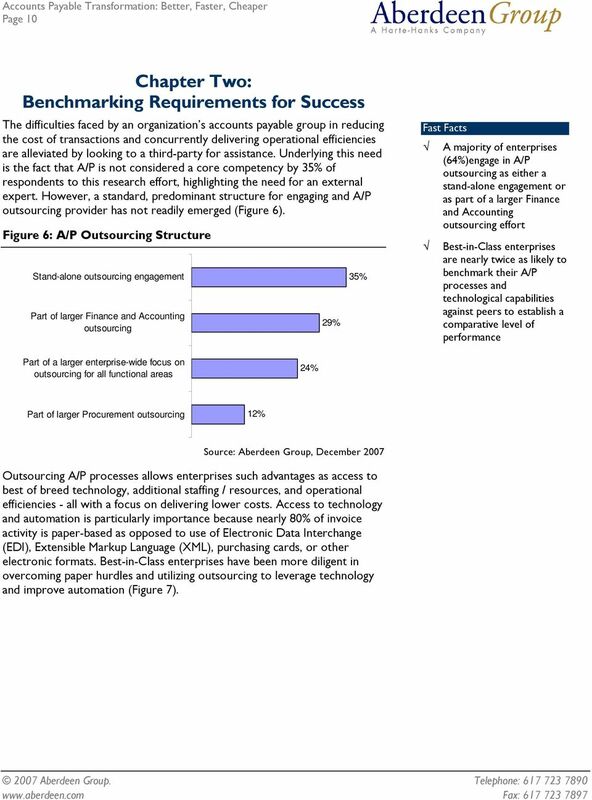 However, a standard, predominant structure for engaging and A/P outsourcing provider has not readily emerged (Figure 6). Figure 6: A/P Outsourcing Structure Stand-alone outsourcing engagement Part of larger Finance and Accounting outsourcing 29% 35% Fast Facts A majority of enterprises (64%)engage in A/P outsourcing as either a stand-alone engagement or as part of a larger Finance and Accounting outsourcing effort Best-in-Class enterprises are nearly twice as likely to benchmark their A/P processes and technological capabilities against peers to establish a comparative level of performance Part of a larger enterprise-wide focus on outsourcing for all functional areas 24% Part of larger Procurement outsourcing 12% Outsourcing A/P processes allows enterprises such advantages as access to best of breed technology, additional staffing / resources, and operational efficiencies - all with a focus on delivering lower costs. Access to technology and automation is particularly importance because nearly 80% of invoice activity is paper-based as opposed to use of Electronic Data Interchange (EDI), Extensible Markup Language (XML), purchasing cards, or other electronic formats. Best-in-Class enterprises have been more diligent in overcoming paper hurdles and utilizing outsourcing to leverage technology and improve automation (Figure 7). 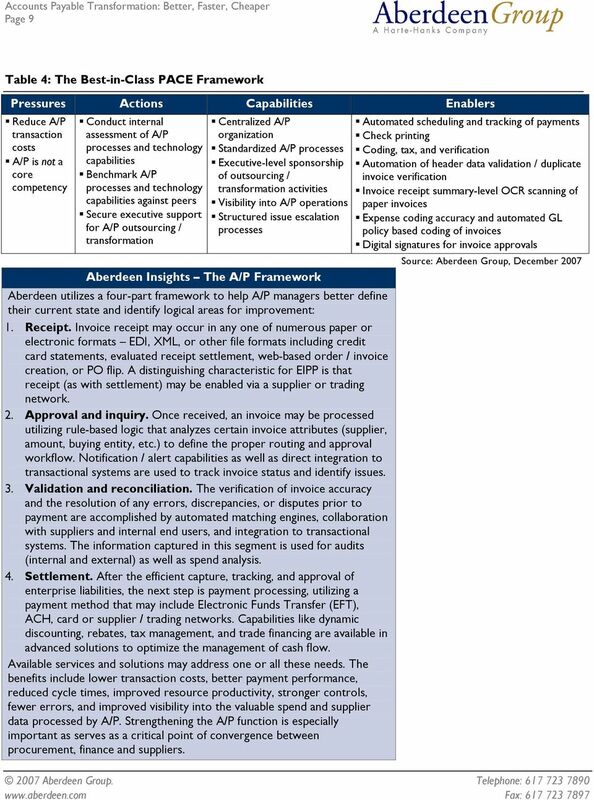 11 Page 11 Figure 7: Automation of A/P Processes Payment scheduling Check printing Payment status tracking Coding, tax, and verification Automation of header data validation/duplicate 23% 77% 43% 69% 53% 69% 39% 67% 43% 61% Automation was a focus for us when outsourcing. Through our relationship, we improved our on-time payments and started getting our discounts. ~ CFO, Small European Telecommunications Organization All Others BIC Case Study Outsource, Automate, Transform Engaging in significant growth, an international luxury hotel group was faced with accounts payable processing issues. They were looking for ways to improve their AP processes and also reduce costs. The goal was to establish a single process that would allow them to easily manage multiple properties in different geographic locations. Additionally, the impact of the Sarbanes-Oxley Act has created an increased focus on improving financial procedures and providing better reporting. A revised AP function was needed to increase expense control and review, as well as improve organizational and filing procedures for invoices. During their evaluation, this enterprise was open to many different solutions, from purchasing additional software to hiring more staff in an effort to improve their overall AP process. The key criteria were that the solution must deliver immediate results, not impact existing operations, and be cost-effective. This hospitality enterprise selected a partner that utilizes a Software-as-a- Service (SaaS) model to deliver their solution in addition to providing outsourcing services through personnel to augment and train current staff. The results were immediate and cost-effective, as the implementation and training took only a few weeks. The staff of the solution and outsourcing provider quickly adopted the hotel group s AP processes and began handling tasks such as invoice receipt and sorting, document imaging and archival, data capture and entry, and payment processing. The software solution became the engine behind the process and provided the technology to manage the notification and approval process as well as a single system to store all of the information in an easy to retrieve and review format. It also easily integrated with the ERP system of record to facilitate the transition. The web-based application proved easy to use so there was a minimal learning curve for new users. This was a turn-key solution in every aspect. 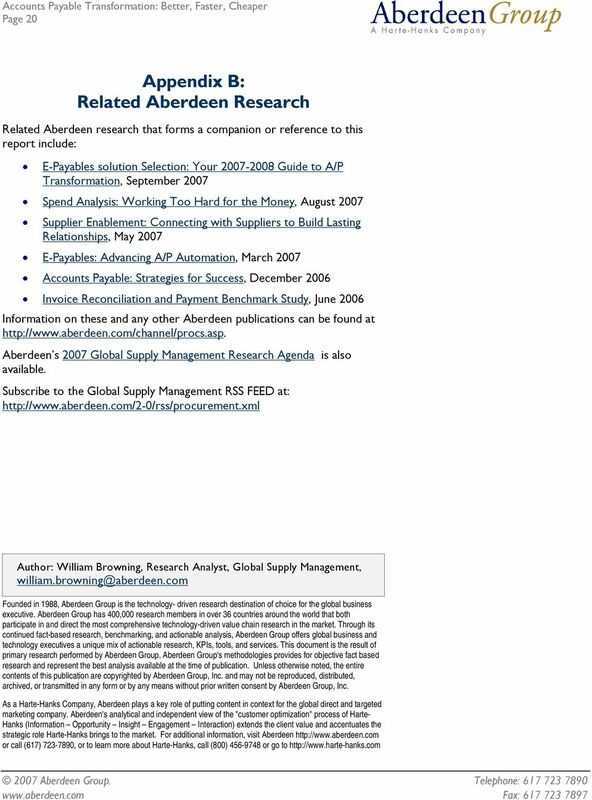 13 Page 13 Capabilities and Enablers Aberdeen s global supply management research has shown time and again that leveraging accounts payable services and tools allows A/P organizations to lower transaction costs and reduce cycle times for invoice processing. In addition to third-party expertise and resources, outsourcing also opens the window to automation as A/P outsourcing providers provide access to best of breed technologies. Organizations that outsource and leverage automation for A/P transformation position themselves ahead of their peers and enjoy distinct performance and organizational advantages. Process In the nascent but growing area of A/P outsourcing, Best-in-Class enterprises are taking advantage of the opportunities presented. Facilitating the success of outsourcing, Best-in-Class organizations are 1.7-times more likely to standardize A/P processes company-wide. Implementing standardized processes ensures that A/P activities can be repeated for optimal results and performance. Organization Utilizing a shared services model for corporate functions enables organizations to deliver the services required as effectively and efficiently as possible. 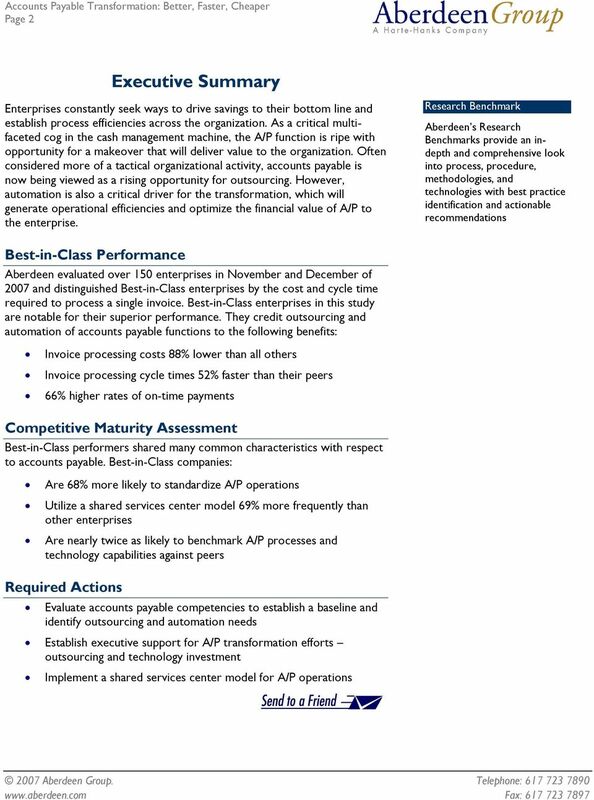 Best-in-Class enterprises are 69% more likely to utilize a single shared services model for A/P operations, establishing a platform for operational efficiencies and removing operational tasks from the corporate headquarters to allow corporate leaders to focus on governance and the strategic direction of the enterprise. Knowledge Management Best-in-Class organizations are 93% more likely than their peers to benchmark A/P processes and technology capabilities against their peers. Doing so allows these better performing enterprises to stay apprised of different practices and advancements in use by other companies, helping ensure that they remain at the leading edge of their competition. The Bestin-Class are also able to establish a best practice approach to A/P based on the intelligence and information collected. A/P Processes Outsourced There are a variety of sub-processes that comprise the accounts payable processes. While organizations in each competitive group outsource different A/P functions to some degree, there is a distinct difference between the rates and specific functions outsourced by the Best-in-Class compared to the other companies: Best-in-Class enterprises outsource audit and recovery activities 150% more frequently than all other companies, ensuring that any errors resulting from A/P activities do not ultimately result in financial loss due to inaccurate billing or payment of invoices. 16 Page 16 performance. Automation of the A/P process not only drives efficiencies and reduces costs, but serves the additional benefit of reducing and eliminating paper from the operation to make A/P more green and environmentally friendly. Best-in-Class organizations are 17% to 143% more likely to automate check printing, payment scheduling, coding and verification, and data validation / duplicate invoice verification than Industry Average organizations. Structure accounts payable as a shared services center. 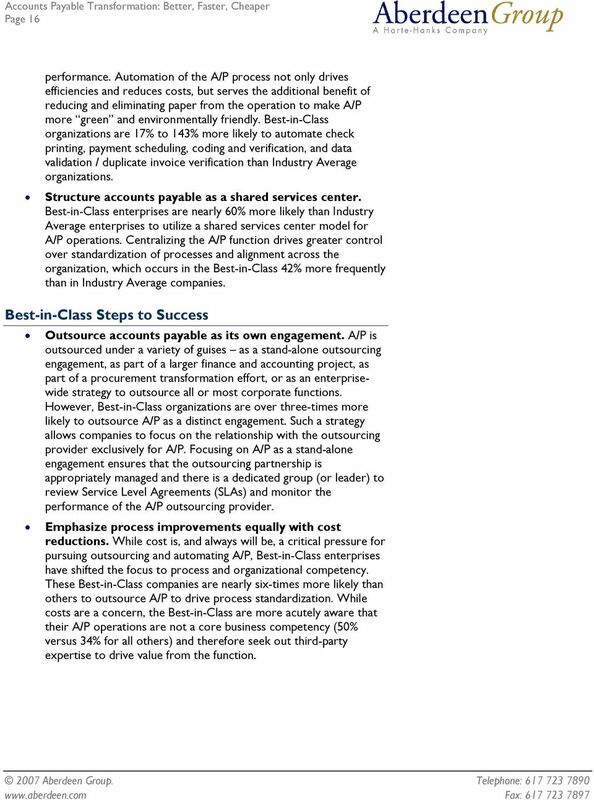 Best-in-Class enterprises are nearly 60% more likely than Industry Average enterprises to utilize a shared services center model for A/P operations. Centralizing the A/P function drives greater control over standardization of processes and alignment across the organization, which occurs in the Best-in-Class 42% more frequently than in Industry Average companies. 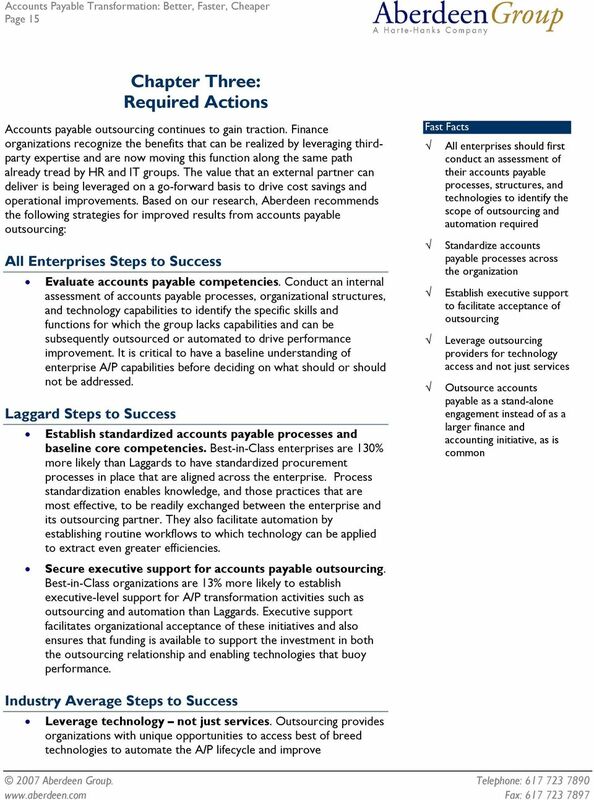 Best-in-Class Steps to Success Outsource accounts payable as its own engagement. A/P is outsourced under a variety of guises as a stand-alone outsourcing engagement, as part of a larger finance and accounting project, as part of a procurement transformation effort, or as an enterprisewide strategy to outsource all or most corporate functions. However, Best-in-Class organizations are over three-times more likely to outsource A/P as a distinct engagement. Such a strategy allows companies to focus on the relationship with the outsourcing provider exclusively for A/P. Focusing on A/P as a stand-alone engagement ensures that the outsourcing partnership is appropriately managed and there is a dedicated group (or leader) to review Service Level Agreements (SLAs) and monitor the performance of the A/P outsourcing provider. Emphasize process improvements equally with cost reductions. While cost is, and always will be, a critical pressure for pursuing outsourcing and automating A/P, Best-in-Class enterprises have shifted the focus to process and organizational competency. These Best-in-Class companies are nearly six-times more likely than others to outsource A/P to drive process standardization. 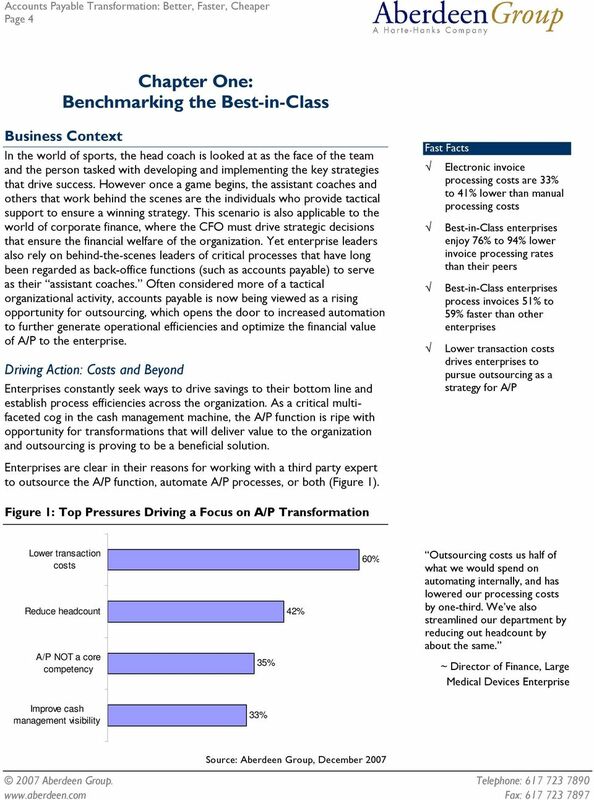 While costs are a concern, the Best-in-Class are more acutely aware that their A/P operations are not a core business competency (50% versus 34% for all others) and therefore seek out third-party expertise to drive value from the function. 18 Page 18 Appendix A: Research Methodology In November and December of 2007, Aberdeen examined the use, experience, and intentions of pursuing accounts payable outsourcing as a strategy for administering accounts payable programs of more than 150 enterprises in a diverse set of industries. 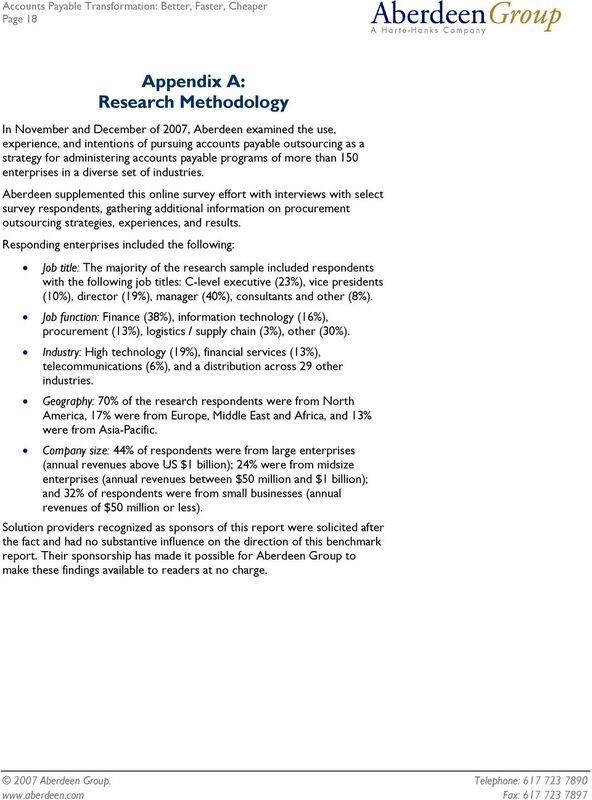 Aberdeen supplemented this online survey effort with interviews with select survey respondents, gathering additional information on procurement outsourcing strategies, experiences, and results. Responding enterprises included the following: Job title: The majority of the research sample included respondents with the following job titles: C-level executive (23%), vice presidents (10%), director (19%), manager (40%), consultants and other (8%). Job function: Finance (38%), information technology (16%), procurement (13%), logistics / supply chain (3%), other (30%). Industry: High technology (19%), financial services (13%), telecommunications (6%), and a distribution across 29 other industries. Geography: 70% of the research respondents were from North America, 17% were from Europe, Middle East and Africa, and 13% were from Asia-Pacific. Company size: 44% of respondents were from large enterprises (annual revenues above US $1 billion); 24% were from midsize enterprises (annual revenues between $50 million and $1 billion); and 32% of respondents were from small businesses (annual revenues of $50 million or less). Solution providers recognized as sponsors of this report were solicited after the fact and had no substantive influence on the direction of this benchmark report. Their sponsorship has made it possible for Aberdeen Group to make these findings available to readers at no charge. 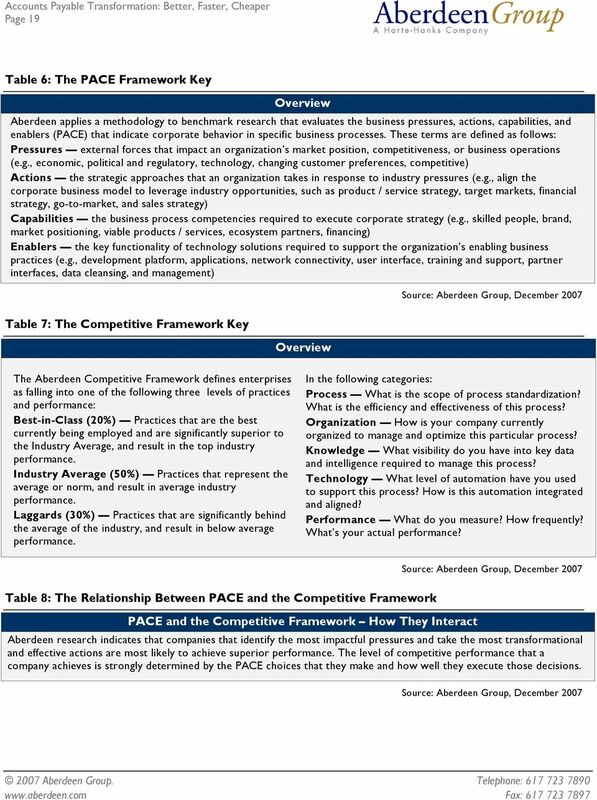 19 Page 19 Table 6: The PACE Framework Key Overview Aberdeen applies a methodology to benchmark research that evaluates the business pressures, actions, capabilities, and enablers (PACE) that indicate corporate behavior in specific business processes. These terms are defined as follows: Pressures external forces that impact an organization s market position, competitiveness, or business operations (e.g., economic, political and regulatory, technology, changing customer preferences, competitive) Actions the strategic approaches that an organization takes in response to industry pressures (e.g., align the corporate business model to leverage industry opportunities, such as product / service strategy, target markets, financial strategy, go-to-market, and sales strategy) Capabilities the business process competencies required to execute corporate strategy (e.g., skilled people, brand, market positioning, viable products / services, ecosystem partners, financing) Enablers the key functionality of technology solutions required to support the organization s enabling business practices (e.g., development platform, applications, network connectivity, user interface, training and support, partner interfaces, data cleansing, and management) Table 7: The Competitive Framework Key Overview The Aberdeen Competitive Framework defines enterprises as falling into one of the following three levels of practices and performance: Best-in-Class (20%) Practices that are the best currently being employed and are significantly superior to the Industry Average, and result in the top industry performance. Industry Average (50%) Practices that represent the average or norm, and result in average industry performance. Laggards (30%) Practices that are significantly behind the average of the industry, and result in below average performance. In the following categories: Process What is the scope of process standardization? What is the efficiency and effectiveness of this process? Organization How is your company currently organized to manage and optimize this particular process? Knowledge What visibility do you have into key data and intelligence required to manage this process? Technology What level of automation have you used to support this process? How is this automation integrated and aligned? Performance What do you measure? How frequently? What s your actual performance? Table 8: The Relationship Between PACE and the Competitive Framework PACE and the Competitive Framework How They Interact Aberdeen research indicates that companies that identify the most impactful pressures and take the most transformational and effective actions are most likely to achieve superior performance. The level of competitive performance that a company achieves is strongly determined by the PACE choices that they make and how well they execute those decisions. Introduction to Invoice Processing Automation CFO s are searching for visibility into near term payables. Is Accounts Payable automation the answer? Technology has transformed the way people process invoices. Profit from the experience of best-in-class companies. VISA COMMERCIAL SOLUTIONS BEST PRACTICES SUMMARIES. Profit from the experience of best-in-class companies.